Photo by Kevin Sweeney The espresso coffee tree planted on Broadway in front of the editor’s home. Time will tell if it is dormant, or just dead. A few weeks ago the Minnesota Department of Transportation put the finishing touches on last year’s Highway 15 improvement project, which included resurfacing Broadway. It planted trees in the boulevards along Broadway where some had been cut down, or were missing. One of the new trees was planted in front of my house, in a spot where the city had unsuccessfully planted a tree a few years earlier. That tree struggled in the salt-strewn and gritty soil that makes up the Broadway boulevards. It put out leaves for a year or two, then it gave up the ghost. Its bark cracked and peeled off, it’s wood dried up. I finally took my chain saw and zipped through its scrawny two-inch trunk and hauled it off to the trash bin in back. It couldn’t have been more than seven feet tall. So I had hopes that this new tree would fare a little better. A tag on one branch informed me it is an espresso coffee tree. That sounded promising. With a name like that I figured it would grow with a buzzed vigor, at least in the mornings before it crashed in the afternoon in need of a Red Bull. But even though the grass has been growing, the flowers blooming and leaves have sprouted on every other tree up and down the street, my little espresso coffee tree stands there looking like a skeleton. I’ve examined its branches and see no sign of buds or new growth. It looks like one of those trees in the middle of no-man’s land in the old World War I movies, blasted, scorched and bereft of vegetation. 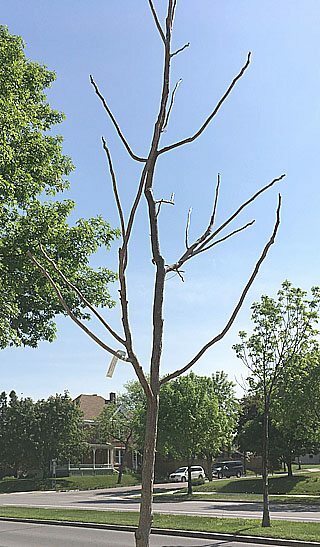 So, I called MnDOT to report that the tree in front of my house looked like a dud, a lifeless twig stuck in the ground. The young lady on the other end of the line assured me that some of the trees take longer to get going than others, that they may be dormant and look lifeless, but that they’ll come around. “Dormant?” I said. “It looks more like it’s comatose.” I would have said it looked like it was in a persistent vegetative state, but I guess plants are supposed to be in a vegetative state. She said the contractor who supplied the trees was heading around town that very afternoon to check on the tree planting project, and that she would take a special look at my tree. Later, I got a call back that the contractor was sure the tree was alive, and just needed some more time. MnDOT has assured me that there is a two-year guarantee on the trees that have been planted. If any of them die before the two years is up, they will be replaced. Well, I sure hope so.